House pests are no joke. Not only is it extremely tedious getting rid of them, they can also cause a lot of menace and trouble. Many folks do all they can to get rid of house pests to no avail. There are a few short lived solutions that don’t really last in the long run. At one point or another, you will find that it is a benefit to hire professional exterminator services. Companies for pest control like Varsity have exactly what is needed to get your house pest-free. As a matter of fact, when it comes to professional services, there is much to gain. 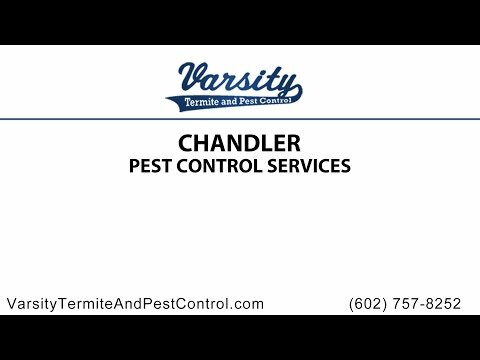 When you hire a professional Chandler pest control service like Varsity, you can rest assured that they know what they are doing. Instead of guessing or trying out different methods at pest control yourself, the folks at Varsity immediately know which pest is handled by which chemical. They not only have the necessary knowledge but also the appropriate equipment for handling various pest types. This takes a load off your back in terms of not having to do everything yourself and also saves you from any health hazard you might otherwise put yourself through if you tried and did this complicated process yourself. There is no need to inconvenience yourself when it comes to pest control. This means that you can set the date and time that is most convenient for you to have the pest control company come and inspect your home. Get a free quote from a reputable company like Varsity pest control the moment you make an appointment for a certified representative to do a home inspection. Due to the fact that professional Chandler pest exterminator services tend to last a long time than do-it-yourself pest control, most homeowners end up saving hard earned money in the long run. Most folks making attempts to control house pests themselves may even put themselves in danger in the process particularly if they are not familiar with the various products and chemicals that are used for controlling pests. Using professional services may even be considered a safety precaution due to the fact that it is experts that clear your home of pests. This means that you don’t have to worry about health issues as certified pest control companies do get everything under control for the most part. Most folks find that it is worth the money you pay for pest control services. Not only are pests eradicated, there are maintenance visits that ensure a pest-free future. With Varsity pest control experts, you can sleep soundly each and every night knowing that your home is absolutely one hundred per cent pest-free. This is probably the reason why this company has gotten such great reviews and has been recommended through word of mouth and other methods time and time again. Remember, when pests get the better of your home, it is time to get highly recommended pest services such as the kind provided by Varsity Termite and Pest Control in Mesa. Call us today!